This article guides you in how to save iPhone contacts to your computer. Visit our Droid Transfer page if you need to save Android contacts instead. If you're getting a new iPhone, and wish to transfer your contacts to it, or if you simply wish to update Outlook with your iPhone contacts, TouchCopy can help. The software allows you to save your contacts from your iPod or iOS device to your PC or Mac as vCards and easily import to your address book or email program from there. On the PC you can also copy contacts directly to your Windows Contacts or Microsoft Outlook. The instructions below also provide details on how to transfer contacts copied by TouchCopy to your other iPhone, iPod, or iPad. Step 1: Download and install TouchCopy if you haven't already done so. Step 2: Run TouchCopy and connect your iPhone, iPod, or iPad. Step 3: Choose the Contacts Tab in TouchCopy. Step 4: Select where you wish to backup your contacts. You can save them as vCards, or backup directly to Outlook and Windows Contacts directly. To view contacts on your iPod, iPhone or iPad in TouchCopy, click "Contacts" in the TouchCopy category list. TouchCopy enables you to easily search through your list of contacts. You can sort your list either by first name or last name by using the "Sort By First Name" and "Sort By Last Name" buttons. You can also search for a specific contact by typing their name in the search box. In TouchCopy, press the Contacts button in the top control panel. This will display the contacts stored on your device. TouchCopy has the ability to export your contact information of your iPod or iOS device into vCard format so that you can put your contacts into other programs. vCards are files that contain contact information about a person or company that can be understood by just about any Address Book or E-Mail program available. For example, vCards can be generated or imported into Windows Address Book, Outlook Express, Yahoo address book, etc. To copy your device contacts, select one or more contacts from the list of contacts in TouchCopy and click the "Copy as vCard" button. To select all your iPod Contacts, use the Ctrl+A key combination. Then simply select the folder you want to save your vCards into. TouchCopy enables you to create a separate Contacts folder to save your contacts to. Once you copied your contacts as vCards using TouchCopy, you can use your email or your address book program to import these vCards. If you are using Microsoft Outlook, open the folder where your contacts were copied and select them all using the Ctrl+A key combination, and drag and drop them to Contacts in Outlook. Outlook will open each contact and then click on Save and Close button to save each contact to your Outlook Contacts. You can then use iTunes to sync Contacts you imported to Outlook or another address book program to another iOS device. Connect your other iOS device to your computer, open iTunes and chose your device under DEVICES in iTunes. Click on the Info tab in iTunes and check "Sync Contacts", chose your address book program and click on the "Sync" button. Note that iCloud needs to be disabled for iTunes contact syncing to work. From your new iPhone, go to "Settings" > "iCloud" and choose "Sign Out" of iCloud at the bottom. Connect your new iPhone to your computer, open iTunes and click on your device icon. Click on the Info tab in iTunes and check "Sync Contacts", choose your address book program and click on the "Sync" button. To copy contacts directly to your Contacts folder in Windows, select the contacts required and click, "Copy to Contacts". 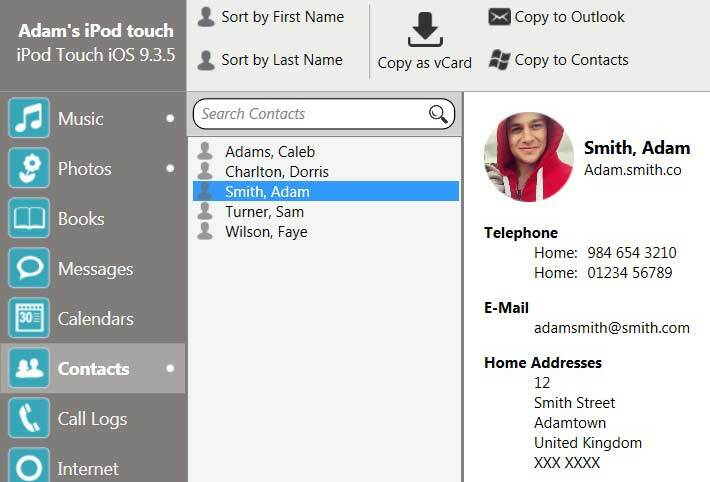 TouchCopy will export the selected contacts to your Windows Contacts. To copy contacts directly to your Microsoft Outlook contacts manager, select the required and click, "Copy to Outlook".